One of the biggest differences between teaching middle school and teaching high school is getting the students to talk to each other. 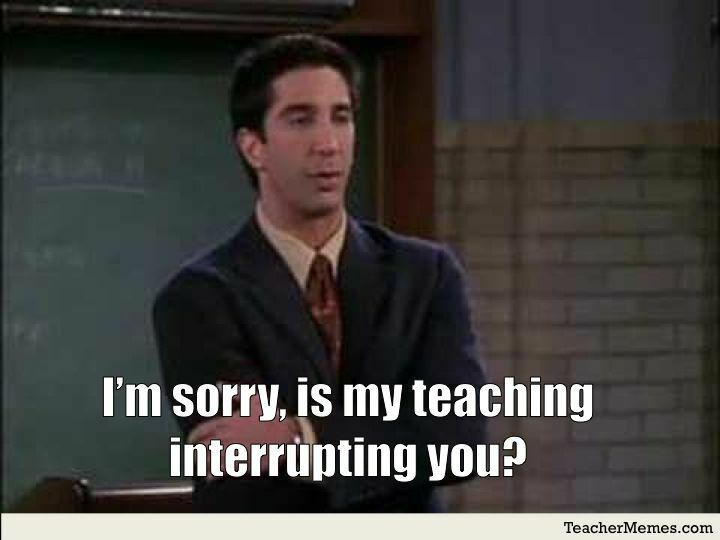 In the 8th grade, I felt like I was constantly telling kids to "be quiet" or "pay attention" or "turn around and look at me please" or "seriously stop poking him and listen for just 5 minutes". But if I could channel all that energy and desire to be social in the right direction, class discussions and student to student communication seemed to almost happen naturally. Students LOVED talking. And all I had to do was make sure they were talking about what I wanted them to. In the 11th grade, it couldn't be more opposite. I feel like I am standing in a room full of lethargic zombies some days just begging anyone to mutter a word or even think about turning toward a neighbor to engage with them. This has really forced me to get creative in my lesson planning, to make sure that I am living up to my daily goal of allowing every student an opportunity to speak every day. But if they aren't motivated to speak, or engaged in the lesson enough to WANT to contribute, they won't. Challenge accepted. I have heard about "classroom jigsaws" at just about every training I have gone to the past few years, but for some reason I have avoided trying it. It just seemed like I could never think about a topic in my curriculum that it would REALLY work for students, and not just be a way for me to check the box to say I have done one. It went INCREDIBLE. I loved listening to the students discussing in their groups how to solve each problem. 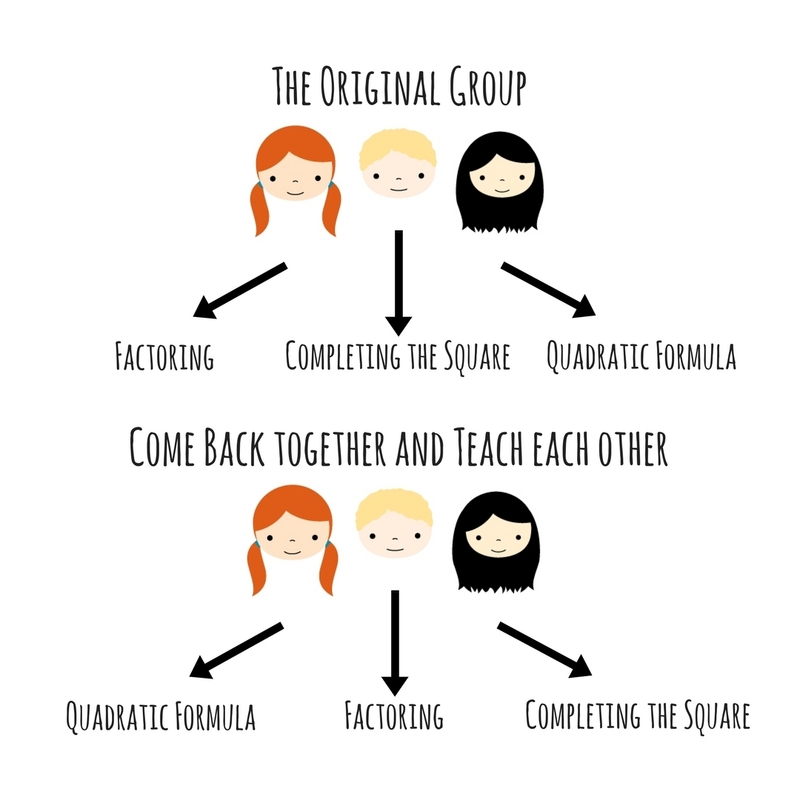 Many students had been a little lost or absent and so when they got to the factoring group they quickly realized they didn't know how to factor that particular problem. 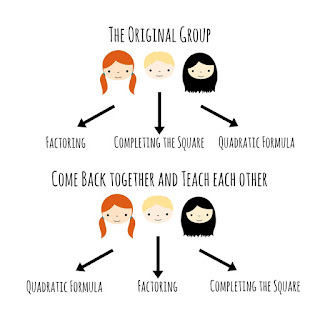 But the pressure of knowing that in just 5 minutes time they would have to go back to their original group and teach their group members was enough to really motivate them to find someone else who was in the factoring group and figure it out. The room was SO LOUD. I loved it. Everyone was talking, sharing ideas, showing each other short cuts and tips, and completely engaged in what was going on. I loved how when they went back to their original group all 3 group members had the same answer already, so the conversation was less about "getting the right answer" and more about how to manipulate the equation and solve it using the different strategies. The student worksheet was super easy to make. You can find my copy here. 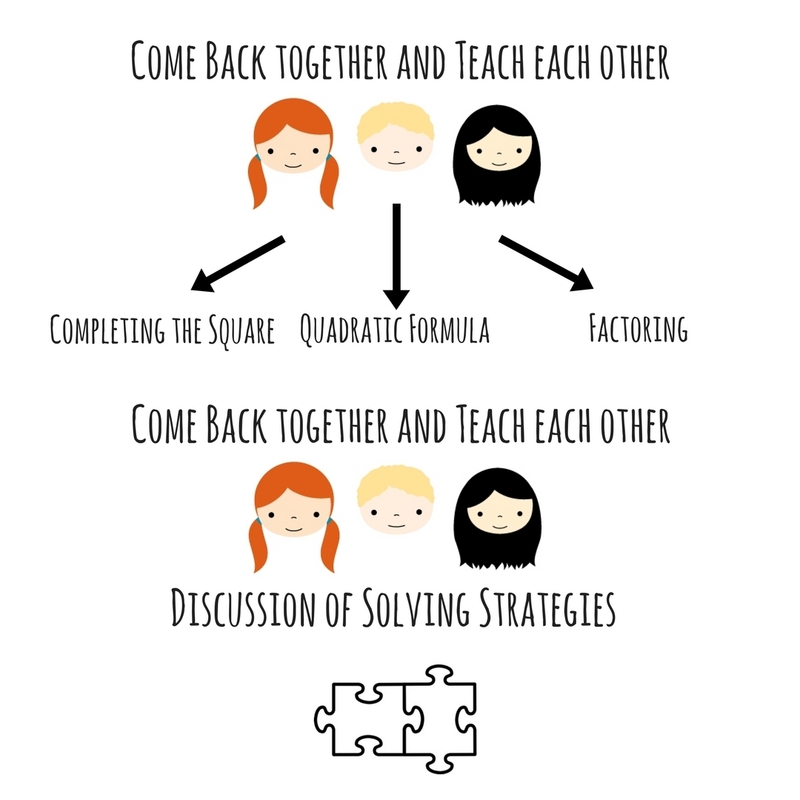 I purposefully planned different equations that would highlight different solving hurdles, so that they would having something to discuss in regards to which strategy was the "best". 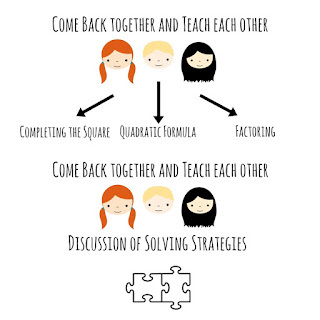 What other mathematics content can you think of that would allow for a jigsaw to actually enhance student learning and increase student communication and collaboration? Love it!! “Every student already had the same answer so the discussion was about the different procedures”! You’re incredible and I miss you daily! !